Years of old, years of age, years of time. I thought I knew generally what a normal 12- to 13-year-old boy should have known, thought I did what a normal 12- to 13-year-old boy should have done, and thought I understood what a normal 12- to 13-year-old boy should have understood. I am a winter person, what my mother calls a Winter Child and my father calls Somebody Who Sees What a Lot of Other People Don’t Always See. I love winter, live for snow, live for cold. Deep cold. We live on an old farm in the northern part of Minnesota where winters tend to be long and dark and cold, and though my parents don’t farm or work the land — they run an internet business out of our home — the small part of the farm we live on is on the very edge of wild, northern forest. It is a perfect place to live if you love wilderness — which I do — and deep winter — which, as I said, I also do — and I folded myself into the woods every chance I got. Which is to say, when I wasn’t in school or doing chores around the house, I would head for the forest. And in there, in the woods, by the time I had gone a hundred yards from the house, everything else wouldn’t, couldn’t, matter. As long as I kept my grades up and did my chores, I was on my own and it was, as I said, perfect. But limited. Restricted in a way I didn’t know or really understand until I came to dogs. More explaining. I have the longest bus ride of any school district in the United States. Two hours each way. And most of that time, I am alone on the bus and I use the time to do my homework and read. Mostly books about wilderness. Or winter survival. And on one ride in late November there was a new boy on the bus. He and his family had just moved down from Alaska, and they ran and raced sled dogs. I like dogs, have always liked them, but never thought of running them in front of a sled. Somehow it just didn’t seem to fit with the way I liked to be in the woods. But this boy, name of Billy Dahlgren, asked me if I’d like to see the dogs and sleds and how it all worked, so I stopped at their house on a Friday, called home to ask and get permission from my parents to spend a night or two at the Dahlgrens’ and in one-and-one-half days changed my whole life. I had never run a dogsled, or ridden on one, or even seen one except in films or television shows. And they harnessed up four older dogs that they didn’t race any longer to a light sled, aimed the dogs down a trail they said was a 20-mile loop that the dogs would run by memory, told me that “gee” was the command for right and “haw” the command for left if I needed to turn, told me to hang on tight and pulled a quick-release snap tied to a tree. There was some kind of a fur-covered explosion in front of me and I was suddenly whipping through the woods at 20 miles per hour. The dogs initially screamed and barked to go and there seemed to be a kind of manic insanity to it that infected the whole kennel — and me — with something close to panic. It all seemed insane and for a mile I don’t think I saw or did anything but hang on and want to live. But as soon as the sled started to move, the dogs grew silent — it turns out they never make a sound while they run — and in a mile or so they settled down to a more controlled run and then a trot, and we wound our way through the forest on a trail down along a frozen river, up a smaller frozen creek, away and up a hill into and through some huge white pines. It was late in the day when we started and it began to get dark but there was a full moon already up and the snow caught the light and made a soft blue white glow all around. And it wasn’t swearing but a kind of praying — a soft whisper prayer of thanks because Someone, Some One had to be thanked that such a thing, such a moment, such a beautiful single incredible moment could exist and that I could see it, know it, be in it. A dance in the moonlight and if that were it, were all of the whole run and whole night and the whole time it would have been enough, would have been all I needed to change my life. But we crowned the hill in the soft all-around light of the night and slipped down the back side, winding through trees onto a large frozen lake, slid out on the snow-packed surface of the lake and were suddenly not alone. 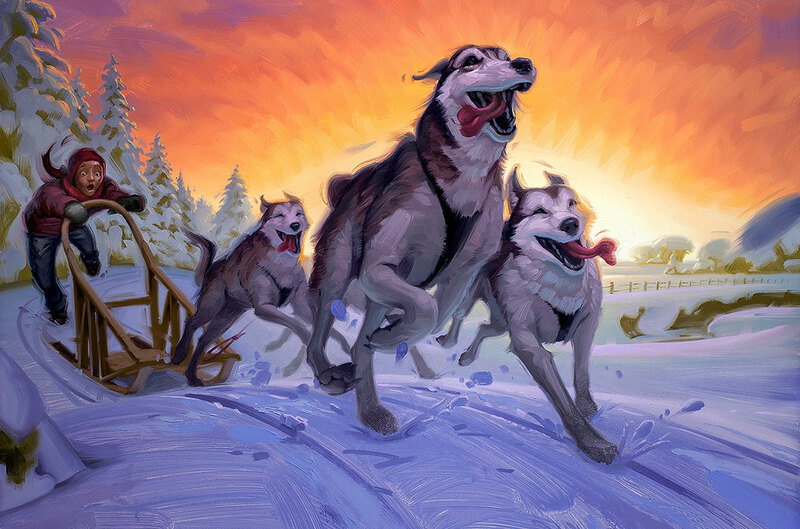 From the side of the lake, out like night-ghosts, moon-ghosts, came wolves — timber wolves — there but almost not there to see in the moonlight; silent, drifting out of the trees onto the lake, there to see and then not see, gray in the silver white light until they were running next to the team. First off, then close, and closer. Close in, almost touching them at first, then still closer until they did touch, dog-to-wolf, dog-to-wolf, but not hard, so near their breath mixed with the clouds of breath from the dogs, running with them as almost a part of them, part of the team, and I thought I should be afraid. Minnesota has many wolves now. I had seen their tracks when hiking, but never a wolf itself. And you hear stories of attacks on livestock, sheep, the taking of pets — cats especially — and here they were, running next to the team of dogs and I thought I should be afraid. I had no weapon, no way to get away. But it wasn’t there, the fear. It simply did not come. Across the lake in the moonlight we ran and never a moment of fear because they were part of it, part of the snow and cold and silence and lake and moonlight and dogs and me. I was of it as well, moving with them and of them and seeing them and knowing them. And, in that moment, knowing myself as well, knowing more of myself than I ever had. At the end of the lake the wolves left us, peeling away and off into the trees and I realized I had not taken a breath for all the time they ran with us and I took a deep breath, then another and almost in that moment the dogs crossed a small frozen swamp, picked up speed through a tiny stand of spruce and blew back into the yard by the kennel. Noise. Dogs barking. Back in the world. The World. The Dahlgrens there to greet me. But I couldn’t speak. I stood there, not sure if I would laugh or cry, still in the beauty of the wolves and the dogs and the moonlight and … and … and. I want, I thought, to go again. And that night, sleeping on a small cot in the corner of Billy’s room at the back of their cabin, I dreamt of wolves. I was on a sled and they were ahead of me pulling it through moonlight along the edge of a lake. Not dogs, but wolves. And they were not attached to the sled but moved it somehow so it followed them, pulling me with it, on it, with them as they ran. And they said to me — not in words but in thought-words — they said the old proverb that a man can never see the same river twice; that when he looks a second time the river has moved and so has he. And so, the wolves said, it was always new. And that life was that way. Always new. And that I was 13 now and had seen this beauty, this incredible thing, and that I would never be there again. Never be 13 again. Never see the same thing I had seen and done with the dogs and wolves again. But there would always be some new place in my mind, some new beauty to see and do every day of my life. As long as I followed them. For more about three-time Newbery Award-winning author Gary Paulsen and his latest book, Fishbone’s Song, visit go.boyslife.org/garypaulsen.